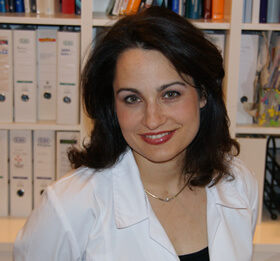 I am pleased that we have found each other and to be your dermatologist in Berlin. In my dermatological practice I offer a full array of dermatological services to help you maintain healthy skin, solve all your problems, and answer all your questions. We diagnose and treat allergies in adults and children in accordance with the latest scientific findings. I perform cancer screening by means of reflected-light-microscope, video documentation, and skin surgeries according to the newest medical guidelines including highest cosmetic standards. I take care of your vein problems, i.e. varicose veins and spider bursts by using ultrasound diagnostics (Doppler sonography), bright LED-light (Veinlite transilluminator), and vein lasers. I dedicate my time to you and all your questions concerning the healthy, problematic or diseased skin, prevention, and anti-aging. Problems such as skin appendages, age related warts, age spots, brown pigment spots, moles, small red and blue blood vessels, couperose (rosacea), scars, wrinkles, coarse-pored and sagging skin, cellulite, and excessive body hair can be treated by soft and guaranteed newest treatment technologies. In addition, I apply the whole scope of laser systems, including fractional laser therapy (Fractional Laser – fractional CO2 Laser, Fraxel® Dual, Fraxel® Restore, ExelO®, pulse light („PL“). I am officially recommended by the Fraxel® Company, holding its advanced certificate. Moreover, I also work with botox, peeling and hyaluronic acid fillers. My specialties include skin tightening, anti-aging procedures, skin rejuvenation, and treatment of wrinkles and fine lines. As a certified member of the German Society for Esthetic Botulin Toxin Therapy DGBT, I exclusively use certified and in the technically-pharmaceutical respect absolutely clean botulin toxins: Vistabel®, Botox®, Azzalure®, Dysport®, Bocouture®, Xeomin® of the market-leading companies Allergan, Galderma, Merz, and Ipsen. The main fields of application are treatment of wrinkles, excessive perspiration and migraine. My certificate of the German Society for Botulin Toxin Therapy attests the security and experience in handling botulin toxin. In application of hyaluronic acid fillers in treatment of deep scars, wrinkles and loss of volume I exclusively use substances whose security, purity, and effectiveness are scientifically proven. I guarantee the highest professional level of my conservative therapy, surgical interventions, and high-tech equipment. When appropriate, I also recommend therapies from the area of naturopathy. My office is official partner of Lufthansa mobility Center, I am member of the German Dermatological Society and selected as a member of the HTH International Healthcare Community and the GeoBlue International Healthcare Community.